Hubby and I have decided to develop a new fragrance. I’m sure it will quickly outsell Chanel No. 5, Cool Water and all those other silly scents combined. I think I’ll just hang it on a string around my neck. It’s that good. Meet Fred Gray of Sparkling River Farm in Mt. Olive. He and his wife Toni are certified chileheads (OK, the business card says “Pepper Rancher”) who supply Argenta Certified Arkansas Farmers’ Market attendees, as well as other markets around the state and in Memphis, with some of the best pepper products around. Saturday, we found the pair with a wonderful array of fresh peppers, from sweet to hot. But the products that will keep me coming back were the ones they created from these peppers. Market attendees could buy fresh roasted peppers in bags, roasted on-site in a tumbling basket contraption right there by the tent. If you’ve ever purchased roasted peppers in a jar, or even (like me) gone through the trouble of roasting your own on the gas stovetop, you should give these super-fresh babies a try. Toni told me about Fred spending the day out in the farm’s smokehouse, and coming back inside steeped in the incredible aroma of peppers and hickory. And yes, she said it still smelled good to her, too, although they both said the smell disappears after being in it a while. Whole pod (reconstituted) in soups, meat sauces, casseroles, pasta dishes; ground pod in above plus rubs, wet rubs, chile pastes, marinades and in ground pepper dispenser on table top. Also called vegan-jerkey! Whole pod (reconstituted) in soups, meat sauces, casseroles, pasta dishes; Infused oils and vinegars; ground pod (dry) in above plus rubs, wet rubs, Chile pastes, moles, marinades, Bar-B-Q sauces and in ground pepper dispenser on table top. Um, yes. All of it. Today, please. So far, I have snipped a tiny bit and infused it into a cream sauce I made for the handmade Chipotle pasta purchased from Argenta Market (I’ll get to them another post!). Tomorrow, I’ll go old school/new school on a crock pot of beans with bacon and one of these bad boys. And cornbread. Nom. Meanwhile, as it gets used up, I’ll continue to just open the bag every hour or so and take a deep sniff. You think I’m kidding. Over the next few days, I’ll introduce you to more of the vendors at the Argenta Certified Arkansas Farmers’ Market. One of the purposes of this blog, I think, will be to encourage you to step out and try a few new things, especially in the area of whole foods or slow foods. Fewer boxed things. More things that were recently growing, and growing locally. I’m certainly not completely there myself yet (I recommended shortening in a previous recipe, for goodness’ sakes), but I’m getting there. Come with me, it’s yummy! Coming soon: Incredible local pickles, cheese, bread and more. And monthly farm-fresh goodie baskets you can pre-order. We’ll eventually get back to Morgan’s Ratatouille. « A Puppy to Love! 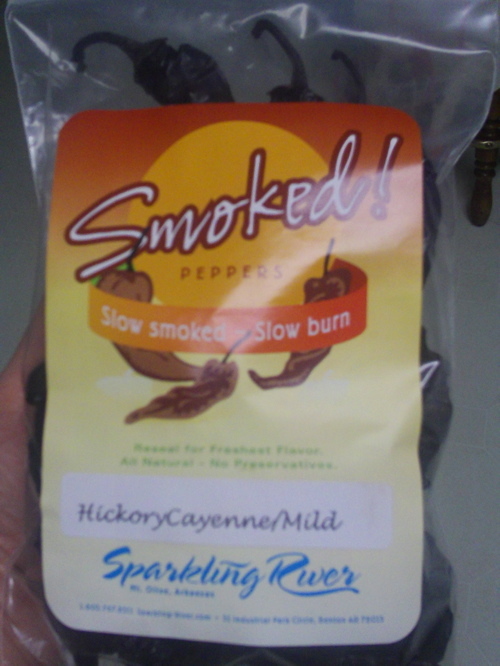 Somehow, someone in the famly purchawsed a bag of smoked hickory marconi sweet peppers recently, probably at the Memphis Farmers' Market. We just finished parsing out the very last few and are desperate for more. Are you coming back to Memphis? Can we go to Mt. Olive? Can we order on-line? Hoping our future is not marconi-less for long! Nice story on Fred Grey--I made piperade with a bunch of his beautiful red marconi peppers. I was delighted to see you and your beautiful family at the market. I think you emailed me about lunch on Tuesday--I've got meetings every day this week--do you have any time next week--would really enjoy a visit. I've had good food at both Reno's and at the little coffee shop next door in Argenta. Looking forward to this series! I'm admin on the bam fb page, so that's how I found you.